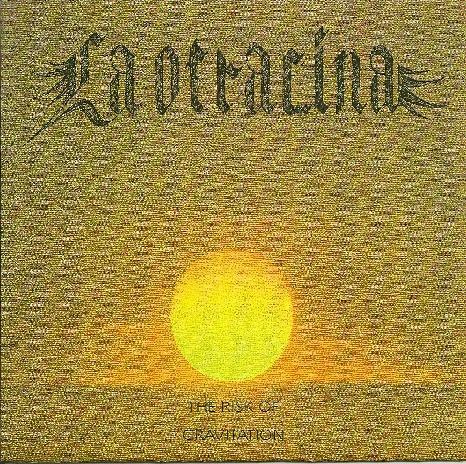 La Otracina - "The Risk of Gravitation"
La Otricina are a Brooklyn three piece who formed in 2003 and in the short time since have released an amazing number of CD-R discs on drummer/vocalist Adam Kriney’s own Colour Sound Recordings. Their full-length debut, 2007’s “Total Eclipse Of The One”, appeared on the Holy Mountain label, while this year’s model, “The Risk Of Gravitation”, is a return to the CD-R/CSR format. Part Comets On Fire, part early Hawkwind, and part Guru Guru-style krautrock, this limited edition disc is 32 minutes of spaced out psychedelic fuzz-rock. Opening track “Walking With The Wild Walkers” is a suitably noisy way of setting the scene, sounding like a UFO landing on your corrugated iron roof. The alien gatecrashers inside are ready to party all night, mess with you head, and raid your beer fridge, while belting out tracks with titles like “Incendiary Mind Delay ” and “Behind The Ocular Curtain”. Evan Sobel’s humungous bass consistently refuses to take a back seat on “Raze The Sky”, which features occasionally quiet patches that just give you time to catch your breath before the next sonic assault. “Crystal Wizards Of the Cosmic Weird” heavily echoes the doom of Black Sabbath’s “Electric Funeral” and “Sweet Leaf”, before the UFO lurches drunkenly back to the stars on “An Ancient Confusion”. Despite battered eardrums and a mountain-sized hangover, you just can’t wait ‘til their next visit. For more information you can visit the Colour Sound Recordings web site at: http://www.vorg.net/csr. The CD (a limited run of 200 copies) can be ordered from http://www.myspace.com/laotracina.